What kind of bucket list doesn’t include the pyramids of Egypt?! Built in 2560 BC, the Great Pyramid of Giza was the tallest man-made object in the world for 3,800 years. It’s the oldest of the Seven Wonders Of The Ancient World, and the only one still standing today. Visiting the pyramids is a pretty simple experience, and there’s not a whole lot to do there except gaze at the big piles of rock, but it’s still a profound and unique experience that every traveler should check off their list. First of all, if you’re on a tight schedule and want to skip the extra steps involved in arranging your own trip to the pyramids, or if you’d rather travel in a tour group for safety or convenience, there are options for doing that. There are a number of companies that offer prearranged day tours to the Great Pyramids and Sphinx for as low as $30 USD, complete with hotel transfer, optional camel ride, and same day return to Cairo. The Great Pyramids are located on the outskirts of Giza, a suburb of Cairo. You can book your flights to the Cairo International Airport (CAI), which is served by a bunch of airlines, and from the airport it’s a 1 hour drive to Giza. The arrivals zone has plenty of taxis you can take, but I used Uber and I would highly recommend this because it’s much cheaper and probably safer too. Do not rent a car in Egypt unless you are familiar with driving in the Middle East! Traffic in Arab countries is dangerous and chaotic, and you’ll be much better off going with a driver who’s familiar with how the traffic works here. Besides, the drivers in Egypt are pretty affordable — as of 2019, the price for an Uber ride from Cairo to Giza is less than 200 EGP ($10 USD). If you’re staying at least one night in Giza, which I’d recommend, then you can drop off your luggage first at your hotel and then easily walk to the entrance of the pyramids and sphinx. There are a bunch of hotels in Giza that are within a 5 minute walk to the main entrance for the pyramids, and they usually have great rooftop views to boot. More on that later. If you’re ready to visit the pyramids, then just head up to the main ticket office and buy your tickets. The scammers and touts will already be trying to chat you up at this point, but you should ignore them. As of 2019, the general ticket price is 120 EGP ($7 USD) and that gives you admission to the sphinx AND the whole area surrounding the pyramids. If you plan to go inside the pyramids themselves, as opposed to just walking around and looking at them on the outside (which is what I did), then you’ll need to buy an extra ticket. The price is 50 EGP for going inside the pyramid of Khafre/Menkaure, or 300 EGP for the pyramid of Khufu. Personally, I don’t think the extra tickets to go inside are worthwhile. The temperature in there can be stifling hot, and the insides were emptied by grave robbers a long time ago. It’s a much better idea to save this money and spend it on a visit to the Egyptian Museum or some of the attractions at Luxor, where you can still see the elaborate tombs and gold artifacts. Anyways, at this point you’ve reached the pyramids and bought your tickets. The security checks at the entrance are pretty brief, and the lines don’t take very long; just watch your belongings. One time I had cash stolen from my wallet while it was slowly making its way through an x-ray machine at the Cairo airport. You will need to decide whether you want to go see the sphinx first, or the pyramids. The sphinx is near the entrance, while the pyramids are a 15-20 minute walk away from the entrance. I’d recommend doing a camel ride to the pyramids, then you can loop back around and stop near the sphinx on your way out. Don’t get scammed! Giza is full of scammers and very aggressive touts (sellers), just like all of the tourist areas in Egypt, so you should prepare to be harassed like crazy by shady people telling you that you can’t walk around the pyramids without a guide (not true), that you are in great need of some service they offer (not true), or that their particular camel rides happen to be the absolute best in the business (okay, maybe). I agreed to a camel ride and then the guy tried to put me on a horse instead, saying it was just as good — uhhhh no deal. Just be firm, and tell them you won’t pay unless you get what you’ve agreed to. If you do go on a horse or camel ride, which I think is a great idea, then be sure to negotiate your price and terms BEFORE hopping on, because it’s common for the touts to try to demand ridiculous prices after you’re already in the saddle and feeling obliged. Do not pay before your ride either, handle the payment after your ride — no matter what they say! As of 2019, the government of Egypt has a fixed price for the camel rides of 50 EGP ($2.75 USD) for 30 minutes. There’s a sign near the entrance that says so, and you can always point to it if you’re having a hard time getting a fair price from the touts. You can also ask your guide to take some pictures of you on the camel using your camera, but be prepared to tip for this; adding an extra 50 EGP is probably fine. Your guide might demand much more, and may get rude or pushy and aggressive, but that’s how it is with everything in Egypt. Just negotiate a price beforehand, and stick with it. Even the most aggressive touts will back down when they see that you won’t. This is a normal part of life and travel in Egypt. By the way, 50 EGP is a great price for a camel ride. I’ve traveled all over the Middle East, and I can say that the camel ride at Giza is MUCH cheaper than what you will pay in more developed places like Dubai or Oman! In other words, if you’re wanting to ride a camel, this is probably the best place in the world to do it. I took two camel rides at Giza, one 30 minute and one 60 minute, and they were both awesome. Camels are a bit scary to ride because you sit so high above the ground, but it’s still a great experience. Plus, you can tell people about that time when you rode a camel at the Great Pyramids of Egypt — epic stuff! Don’t forget to stop at the Great Sphinx too. This mythical creature with the body of a lion and the head of a pharaoh, is the oldest surviving sculpture in Egypt. It’s also included in the same 120 EGP ticket you bought at the entrance for the pyramids, so just show your ticket at the doorway to the sphinx and you can walk up to it. On the outside, there’s also a great photo spot near the gate, where you can take a frontal shot of the sphinx and Pyramid of Khafre together (seen in the pic above). Sadly when I visited, I wasn’t able to get a full profile shot of the sphinx’s body and paws since it had some scaffolding on it, but I think that was because of Melania Trump’s visit the week after. Also take a minute to check out the massive stone blocks in the entryway! The weight of these blocks must be insane. There are a bunch of neat hotels in Giza that are within a 5 minute walk to the main entrance for the pyramids, and they usually have awesome rooftop views of the whole area. 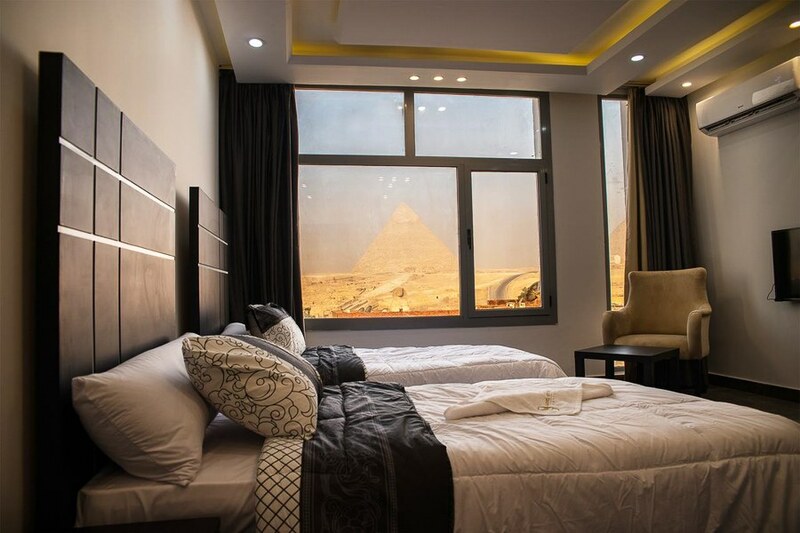 I would highly recommend staying at least one night in Giza, because it allows you to go at a relaxed pace and make the most of your time there. It also makes it easy to do the Sound & Light Show, or just sit back and watch the sunset at Giza. I stayed at Marvel Stone Hotel for $32 USD/night, and it had a great rooftop terrace with views of the pyramids and sphinx, complete with easy chairs and even a pool table. This was actually one of the highlights of my trip to Giza, because I was able to sit back and admire the pyramids and the camels running around in the distance — without being harassed by sellers and touts. In the evening I watched the sunset over the Pyramid of Khafre and took some photos from the rooftop. When Is The Best Time To Visit The Pyramids? Egypt has an arid climate, so it’s hot and dry year round. The coolest months are from December to March, and this is probably the most popular time to visit the pyramids, but honestly any month in the spring or fall would also be fine. I visited Egypt in September, and the heat was bad at times (mostly in Luxor), but I didn’t think it was too much of a problem in Giza. Northern Egypt is not nearly as hot as nearby Middle Eastern countries like Qatar or the United Arab Emirates. You can take photos of the pyramids in the morning, but the dust will obscure the colors a bit. The best time of day for taking photos at the pyramids is around noon, when the dust clears up and the blue sky can be seen in the background.